Claire Harrison is a Campaign Manager at blooom. A high-fiver, thinker, and coffee drinker, Claire loves the Oxford comma and clean design. She’s werkin’ hard to help people learn about their retirement savings and how easy blooom is to use. “Don’t put all your eggs in one basket” is a phrase my mom used a lot when I was growing up. (Although once, memorably, she fumbled it into “don’t put all your baskets in one egg,” so of course that’s now how the saying goes in my family.) Essentially, putting your eggs in multiple baskets means spreading out your risk – if one basket gets dropped, you won’t break all your eggs. It’s an old adage that makes for good advice in a number of different situations, but especially when it comes to investing. Currently, with the market in a rough patch, a lot of clients are reaching out to us with totally understandable questions around why we recommend their allocation include particular asset classes – such as stocks from emerging or developing international countries, for example – that are performing poorly. When an asset class declines in value, that should be a indicator to move into something better performing, right? Unfortunately, it’s not that simple. Sometimes the ‘obvious’ answer when it comes to investing is the exact opposite of what will yield the best long term results. This is because when we’re asking these questions and looking at the performance of these funds, we’re inherently looking at the past, rather than the road ahead. In the above chart you can see that the asset class I mentioned, funds from emerging markets (noted on the chart in purple), is indeed at the very bottom of the list for 2018, with an annual return of -14.3%. However, emerging markets is a great example of an asset class that has been both at the very bottom AND the very top of the chart in various years, including back to back. In 2017, it was up 37.8%! From 2004-2007 it was up over 25% for four years in a row! 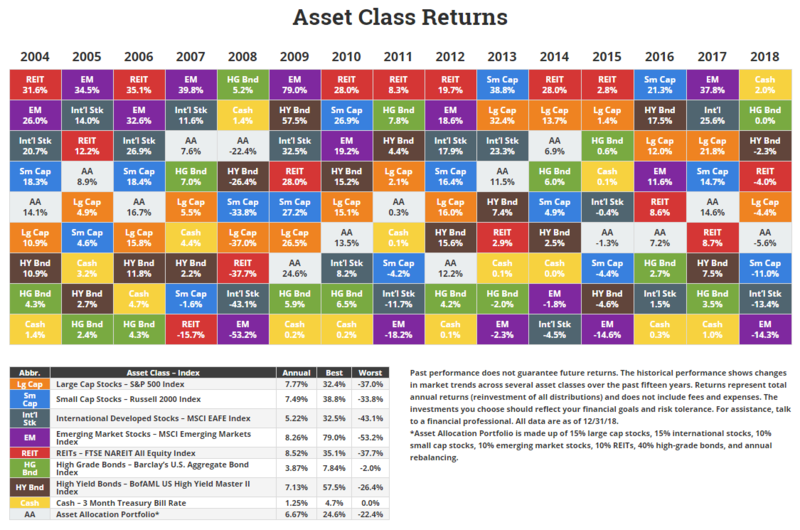 This is why creating a diversified portfolio that includes many different asset classes is so important: what is up one year may come down the next and vice versa. Of course everyone would love to be invested solely in the top class every year, but trying to somehow predict what that will be ahead of time is a loser’s game, especially if you’re betting your life savings on getting it right! Instead, putting those eggs into multiple baskets spreads out that risk and leads to more stable long term performance. The opposite is true as well though – we’re hearing from a lot of folks saying they’re going to move everything to cash to somehow ‘wait out’ the current market volatility. After all, cash is actually sitting at the top of the chart in 2018, right? But if we go back the two years previous, we can see that those sitting on the sidelines uninvested missed out on HUGE returns. Additionally, with a downturn already in progress, getting nervous and selling out only locks in any losses you’ve had so far. Remember: stocks aren’t money sitting in a bank, they’re a tangible item. The number of shares you own never declines unless you sell. Therefore, if you expect those shares to be worth more in the future, you do yourself a disservice by selling them now. Picking an age-appropriate, diversified strategy and investing for the long term isn’t as exciting as chasing the latest hot stocks or betting on “expert” advice from pundits trying to sell better ad time. But it’s what’s proven time and again to be the most effective. It’s human nature when we see a perceived problem – like watching an account’s value decline – to want to take action to fix it. We want to change something, try something new. But when it comes to investing, as long as you’ve got your eggs sitting in the multiple baskets of a diversified portfolio, you’ve already done the right thing. We’ve all heard the adage a million times, but even if the market has you mixed up, try your best to remember what’s important…. don’t put all your baskets in one egg. This information is provided for discussion purposes only and should not be considered as advice for your investments. Nearing retirement? Check your buckets. My dad recently retired from his lifelong career in higher education. Over the course of that career he worked hard to both provide for his family and to save diligently for the future, ending up with a sizable nest egg in his 403(b). But lately, with the stock market struggling this year, he’s been understandably stressed to see the value of his account decline over the last several months, especially after the record gains he saw in 2017. In trying to explain to him why he shouldn’t panic, I realized that a lot of the arguments for staying the course in a down market resonate better with a younger audience than someone like my dad who’s already near or at retirement. “I don’t have years to wait for the market to rebound,” he told me. “Your mother and I are already drawing down from that account.” This anxiety is completely understandable, but it’s founded on a couple of false premises. When most people hit retirement they don’t withdraw their entire account at once, but rather slowly over time. Thus, the idea that you don’t still have years left for the account to grow is not necessarily correct. One way to conceptualize this is to think of your retirement account as being held in two completely separate buckets. If you’re a blooom client at or near retirement, these buckets are likely relatively equal in size (though one may be slightly larger or smaller based on your risk tolerance). The first bucket is the money that you are actually drawing down from. It’s held almost entirely in cash equivalent positions and more stable income funds, such as bonds. This bucket likely won’t grow very much, but it also won’t fall considerably either. It’s your income generating bucket. In a prolonged stock market decline, you can be relatively comfortable knowing that this bucket will help preserve enough of your nest egg to provide multiple years of income while you wait for the market to rebound. The second bucket is still being held largely in equities, which are likewise still susceptible to big market swings. This is the bucket that likely makes you nervous when you see your account value decline, but remember: you’re not drawing down from this bucket! In truth, you need that volatility in this portion of the account, because it also brings with it historically much higher growth than your income generating bucket. If you’re hoping for your retirement to last 20+ years, continued growth is key. When you hope to retire in six months and see your account value decline, it’s easy to worry like my dad that you “don’t have time” to wait out the market. But instead of thinking you only have six months, think instead about how many years you hope to spend in retirement. That is how long you truly have to still ride out the ups and downs of the market, while your income generating funds are more safely sheltered from any storms that might be brewing. So if you’re in the same boat as my dad and find yourself frantically checking your account balance weekly or even daily, just remember that with an appropriately diversified portfolio time is still on your side, even after you’ve hit the promised land of retirement! Investing involves risk. Past performance is no guarantee of future results. Just because an investment performed well in the past does not mean it will do well going forward. And vice versa. The information is provided for discussion purposes only and should not be considered as advice for your investments. Simple Resolution #1: Protect your credit. Check it, then protect it. It’s now free to freeze your credit. Did you know that it’s now free to freeze and protect your credit at all the major credit bureaus? Equifax, Experian and TransUnion allow you to take the precautionary measure to freeze your credit to prevent fraudulent activity. So if you don’t plan on opening any new lines of credit in the near future, you may want to put yours on lockdown! Simple Resolution #2: Schedule your physical. What good is financial health if you’re not around to enjoy it? Feeling healthy? Great! It’s still worth a visit to the doc. Not only does it keep that line of communication open, you get that piece of mind knowing all your parts and pieces are in good working order. Plus, many insurance plans cover the cost of a yearly preventive health care visit. What’s up, doc? Simple Resolution #3: Fix your 401k. Which funds are best for your situation? Ask blooom. Simply saving money is a HUGE step towards retiring comfortably. (So, pat yourself on the back for that one.) However, if you’re not 100% confident you picked the right funds for your situation you may want to look into our FREE checkup. No strings attached. After you see the health of your account, hire us to make the changes. We’ll keep your account monitored and managed alllllll yeeeeaaar long. New year’s resolution COMPLETE. In recent years, investors have grown accustomed to seeing their savings grow at some impressive clips and have seemingly forgotten that markets go up and down by nature. We drown in news about what the negatives could be, but we’re here to help you through it. Here are some items to help you become an expert shopper. Never go to the grocery store hungry. Make a plan and stick to it. You wouldn’t normally just show up to a random store and wander aimlessly throwing money about. Saving and investing are similar – there’s a lot of distractions and having a plan when you’re in a solid frame of mind will help you when things get hectic. You would never jump into a big purchase without reading the reviews to figure out which product is best for you. Savings vehicles, whether your 401k, HSA, 529, you name it, could benefit you in different ways. So do a little research before you start dumping your hard earned dollars into a new account. OR just hop into your blooom account and chat with one of our experts. We’re here to help you make the best decision for your situation. Stock up while supplies last! When the markets drop, think of it as a sale on savings! It’s a great time to consider whether you’re contributing enough to your 401k and other savings accounts. If your debt is under control, and you can afford to put away a few more dollars… a downturn may be the time to do it! You get the most out of a new gadget when you know how it works. Here’s the quick start guide: Stocks go up. Stocks go down. Repeat. Understanding how the market operates can help you make the most of it in the long run. Taking advantage of “sales “ can help you get the most out of your savings and not panic when things seem to be going haywire. While the market remained bumpy at times, US stocks ended the month up slightly from where they ended October (down almost double digits). While the sun began to peak through the clouds slightly last month in the US, overseas markets continued to lag behind. Globally, stocks remain in the negative for the most part, with US stocks coming in slightly positive… but nowhere near the returns investors were bragging about at the dinner table last Thanksgiving. Holiday shopping season is upon us, but as you’re planning to check gifts off your list this year, remember that the stock market tends to have several big sales every year too. While October wasn’t fun and November wasn’t great either, there are still great opportunities out there. Market corrections can seem ominous, but remember, the occasional rain shower is necessary for your flower to grow. Also, this cloud isn’t lingering on your flower only! Most of the world is living with the same weather pattern. So put on those rain boots and make the best of these gloomier stock market days. Read more about how we’re approaching unpredictable markets here.